It's up against some formidable competition, but Kia is famed for its value for money offerings, and the hybrid Niro continues that trend. 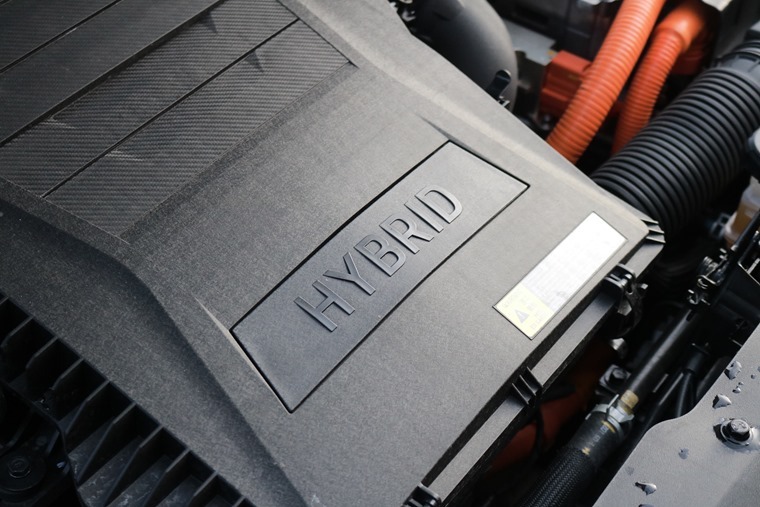 Hybrid tech is being embraced by manufacturers the world over, and the same can be said for crossovers with trendy names. The Kia Niro is a car that embraces both these concepts. As a crossover and a hybrid then, this is a car with a host of formidable rivals. It’s taking on the established hybrids like the Prius, as well as new ones like the Ioniq. That crossover shape means it’s also taking on the likes the all-conquering Qashqai the Renault Kadjar as well as smaller SUVs like the new Peugeot 2008. So with so much competition, is this hybrid worth considering? The Niro has a sleek, understated appeal. Externally, it’s business as usual, with the Niro benefiting from that tried-and-tested crossover look. Which is actually a pleasant departure for a hybrid. 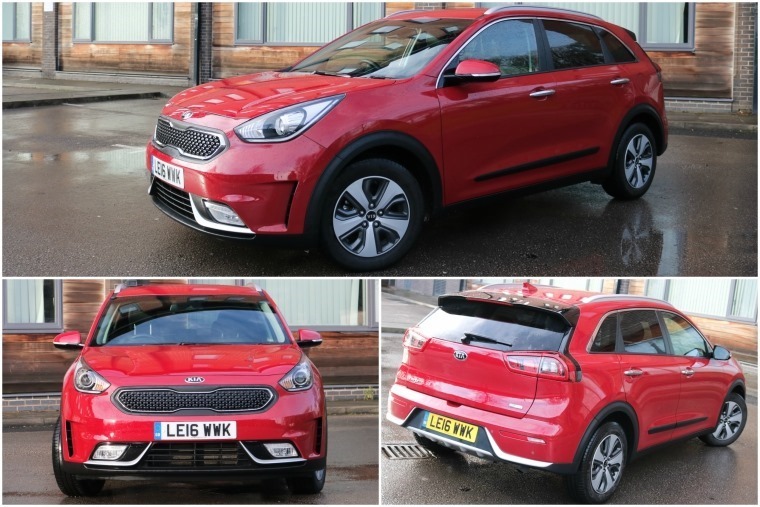 Rather than making a song and dance about its eco-credentials with weird and wacky looks like some would, the Niro has a sleek, understated appeal to it. That’s not to say it doesn’t have its own individual style; it isn’t just a carbon-copy Sportage with a hybrid badge on the boot. 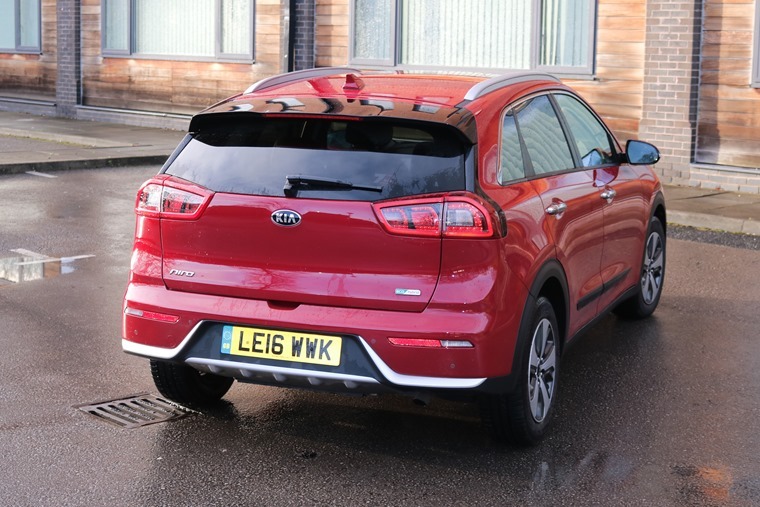 Being slightly smaller than its sibling gives it a lower roof line, although Kia’s trademark grille remains, while LED tail lights give it an upmarket feel too. That crossover body style translates well on the inside too, which is much more capacious than the Prius. Rear legroom really is quite impressive, and the 420-litre boot make it a great proposition as the family car. Cubbyholes abound too and, unless you opt for a spare wheel, a useful storage tray lies beneath the flat boot floor. 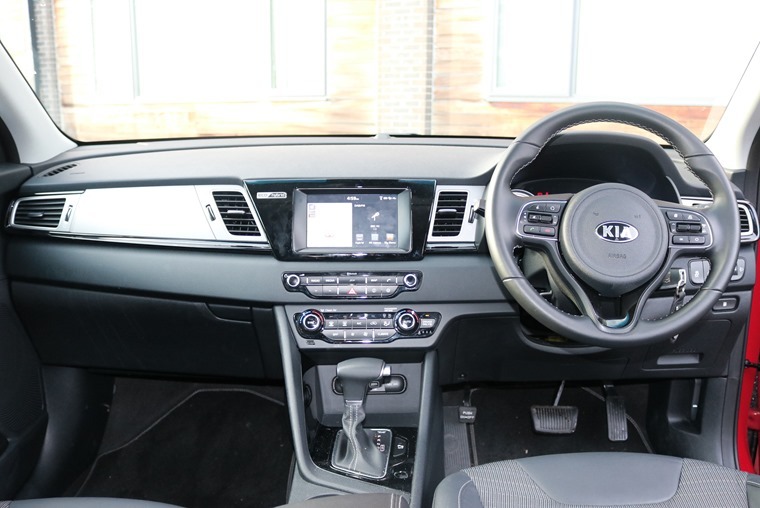 We’ve come to expect good things from the latest Korean cars in the quality stakes, and the Niro’s first-rate interior is another string to Kia’s bow. Soft-touch plastics cover the dashboard and doors, although things are a little flimsier the further down in the cabin you look. The Niro’s first-rate interior is another string to the company’s bow. Overall however, it’s definitely on par with any mainstream European crossover. We now also assume (thanks largely to the futuristic Prius), that a hybrid will come with controls and a dashboard from the Starship Enterprise. That’s not the route Kia has taken. Everything is where you’d expect it to be, and apart from the ‘ECO-Hybrid; badging on the dash, at a glance you’re hard-pushed to tell it’s a hybrid at all – from the passenger seat at least. Spec-wise, we tested the mid-range 2. 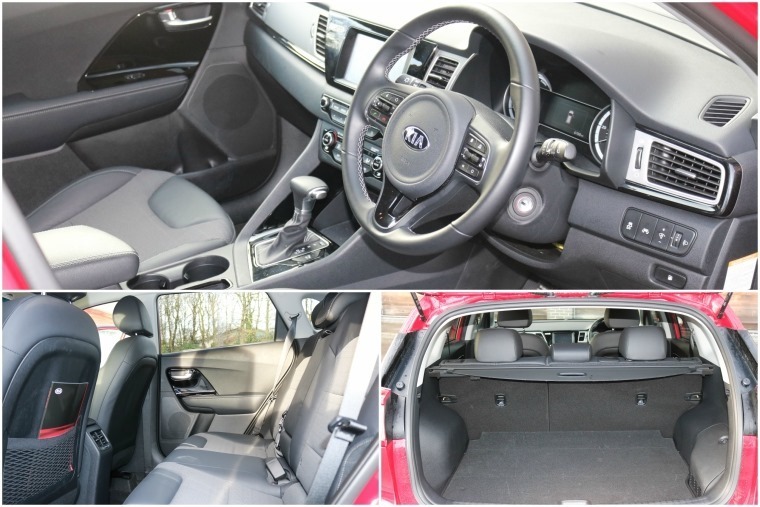 It comes with dual-zone climate, satnav, reversing camera and a great infotainment system. We were particularly impressed by how easy the touchscreen is to navigate; far less distracting on the move than many of its rivals. You can also switch views to see what the hybrid system is up to, and even grow your own on-screen eco tree. Amusing at first it may be, but it can be a little distracting. We’d suggest sticking to the satnav/radio view! 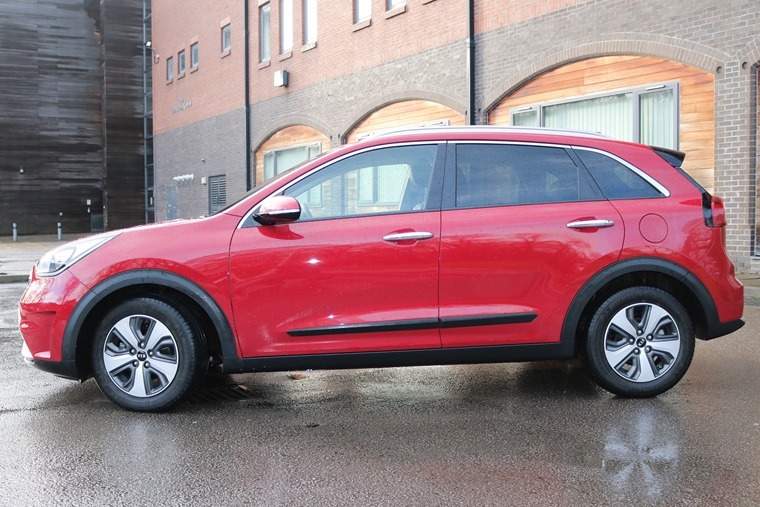 The Niro’s ride and drive prove that Kia got its first dedicated hybrid model spot on first time. If you’re considering a hybrid such as this, we’d guess top driving dynamics isn’t your top priority. Largely however, the Niro’s ride and drive prove that Kia got its first dedicated hybrid model spot on first time. The engine itself is a 1.6-litre petrol producing around 100bhp, while the 43bhp electric motor helps out around town and adds a useful amount of torque when you need it too. Getting from 0-62mph in over 11 seconds, it’s clear the Niro isn’t built for speed, but unlike other electric-petrol drivetrains, it uses an excellent dual-clutch automatic gearbox. This means there’s a “sports mode”, as well as the option to sequentially change gear yourself should the mood take you. On the whole it’s a slick set up, and in sports mode it belies those rather leisurely official acceleration stats. As we mentioned though, this isn’t a car that’s designed for speed. What it is, is a supremely comfortable cruiser. The high driving position and impressive gearbox make it an ideal car for both tedious traffic jams and eating up miles on the motorway. Something that isn’t so impressive on faster roads is fuel economy. Around town, the electric motor takes the strain and 50+ mpg is attainable when you’re crawling through traffic. 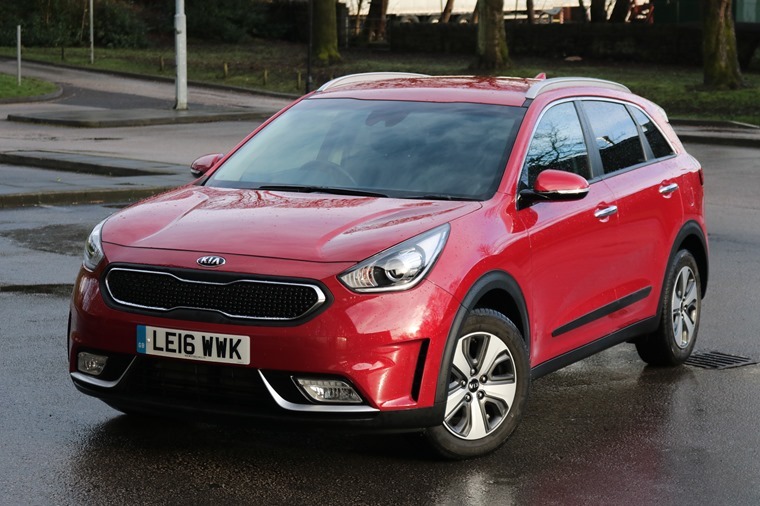 Kia has claimed the Niro is capable of up to 74mpg but, as we discovered, real-world driving makes this almost impossible. It might be impressive in town, but hit the motorway and you’ll see average consumption dwindle into the mid-40s. 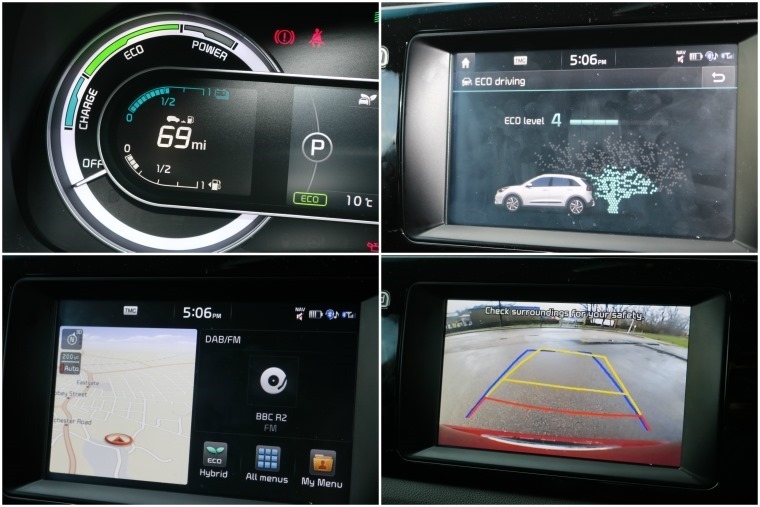 So while the Niro is a hybrid, you shouldn’t expect to see that claimed figure day-to-day. Kia is famed for its value for money offerings, and the Niro continues that trend. It’s certainly a cheaper eco-option than the Prius, thanks to a list price of £21,295, undercutting it by just under £3,000. Similarly, you can lease one from just under £200 per month*, while the Prius’ monthly payments for equivalent deals start at around the £275 mark*. Kia is famed for its value for money offerings, and the Niro continues that trend. On the other hand, it’d be wrong of us not to point out that a Sportage – the Niro’s larger, conventionally powered sibling – can be had for a lower price*. Admittedly, you’ll have to tick more boxes on the options list to get similar levels of kit, but if it’s outright capaciousness you’re after, there are roomier cars that cost less. Back to that question though: should a Niro be on your shortlist? As an eco-choice, it’s quite a way off more established hybrids’ in the mpg stakes, but in truth, that’s not how Kia has marketed the Niro; it’s much more than just a hybrid.